Bored about walking tours? Street art immersive experience is here. 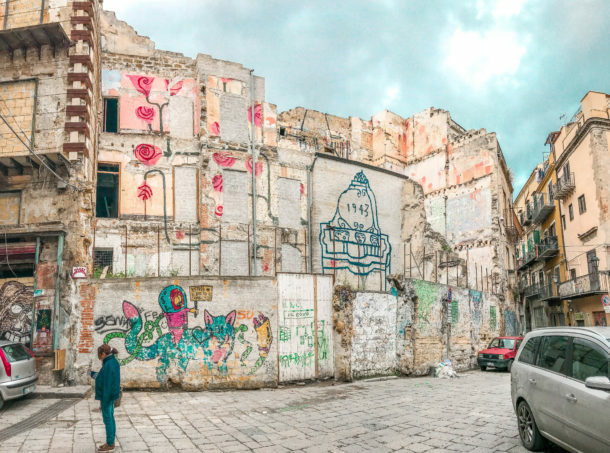 Palermo’s walls are filling up with colours thanks to local and international street artists: discover them! Momo, Chips Mackinolty, Astro Naut and many others helped to shape the new face of Palermo. 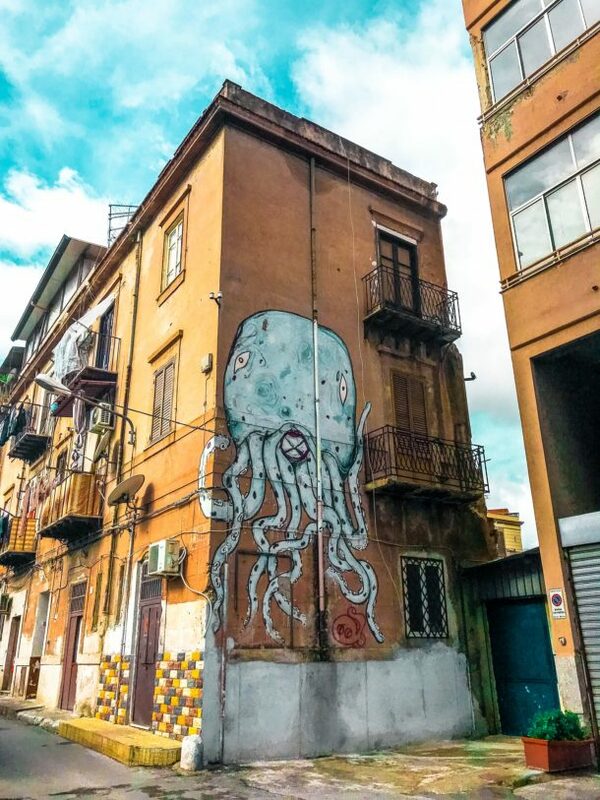 There are more than 280 urban art pieces: choose your favourite way to discover the Palermitan street art. That’s what we did to start! With Enrica, our passionate and friendly guide of “Alternative tours Palermo” we walked through the main neighbourhoods of Palermo ( Borgo Vecchio and Vucciria) to discover the incredible murales and know a bit more about the social and urban development projects that made this possible. Talk with locals, hear the storytelling with a Sicilian accent and have the chance to feed your curiosity with a lot of questions is what technology would never give you. So don’t miss the opportunity to have a local guided tour ever! The tour lasts around 2h30 and starts near the harbour and finishes in Piazza Magione (Monday to Sunday) Cost vary according to the number of people attending the tour. You can have a private one or looking for the free weekend tours organized in group of 20 ppl max. Plenty of interactive maps can help you to create your own walking tour or to combine it with a guided one for a enhanced experience. This Borgo Vecchio street art map guides you to discover an interesting social promotion project developed by PUSH. and “Per Esempio Onlus” in collaboration with the street artist Ema Jons and 20 teenagers from Borgo Vecchio. During after-school creative workshops, drawings and paintings were produced to decorate buildings in the neighbourhood as a form of unusual art education combined with the involvement of the entire urban community. 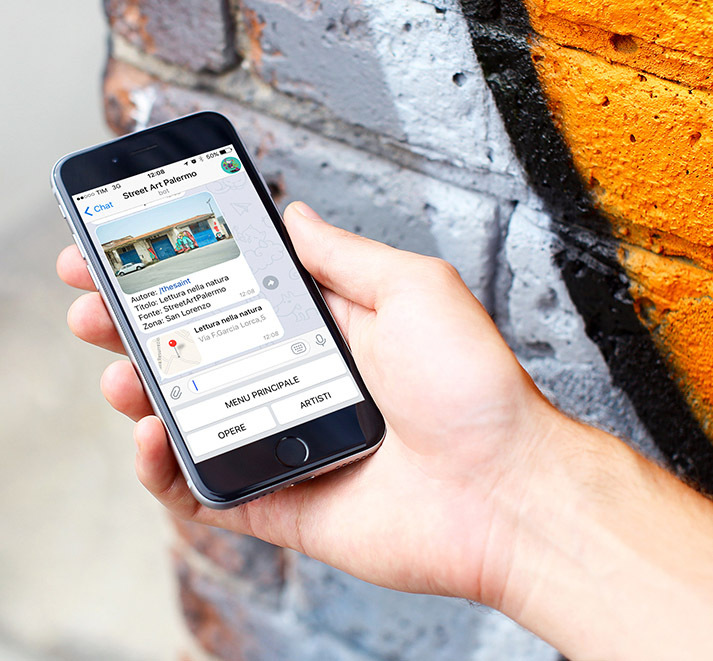 If you have telegram you can benefit from a new Telegram Bot developed by a young Sicilian developer Gabriele Dell’Aria which provides information about Street Art in Palermo easily and interactively. You can just use the section “trova opere”, sending your position and getting a list of the nearest art pieces around you. Each artwork comes with a photo, a little description, a bio of the author (with all the related sources) and a map which locates the point. 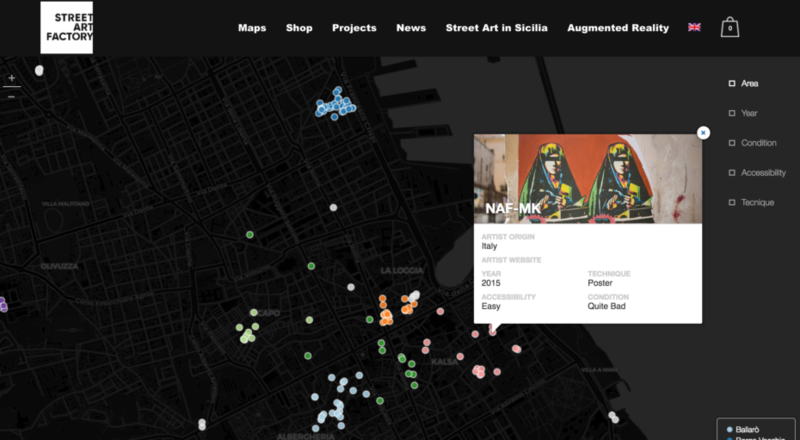 A comprehensive map by Streetartfactory that can be easily filtered by area, graffiti condition and accessibility, year of production. Don’t forget to follow their instagram account @streetartpalermo for visual inspiration and up to date contents. 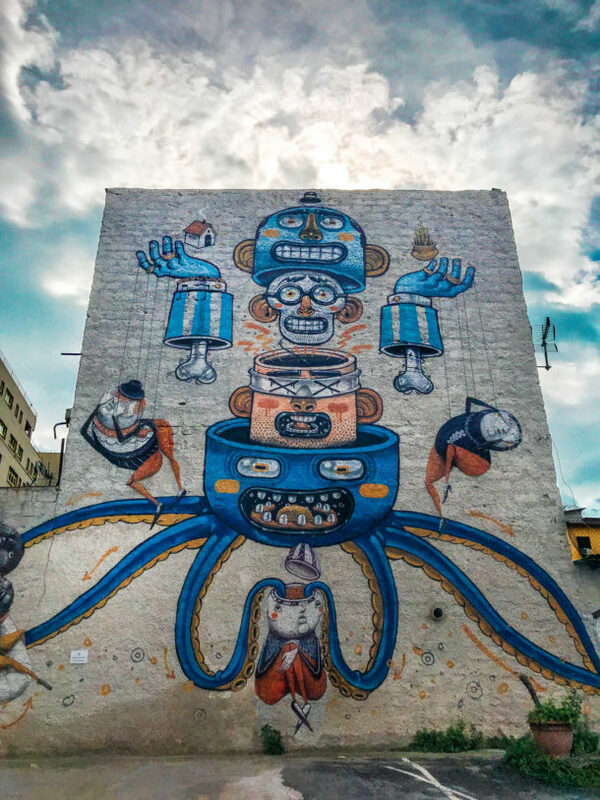 Street Art Factory, in collaboration with Bepart and PUSH (a Design Lab that applies Service Design to social projects for cities and communities development), also created the first Augmented reality tour focused on urban art. You will have the chance of combining a guided street art walking tour with the use of the augmented reality for an amazing, funny and interactive experience. 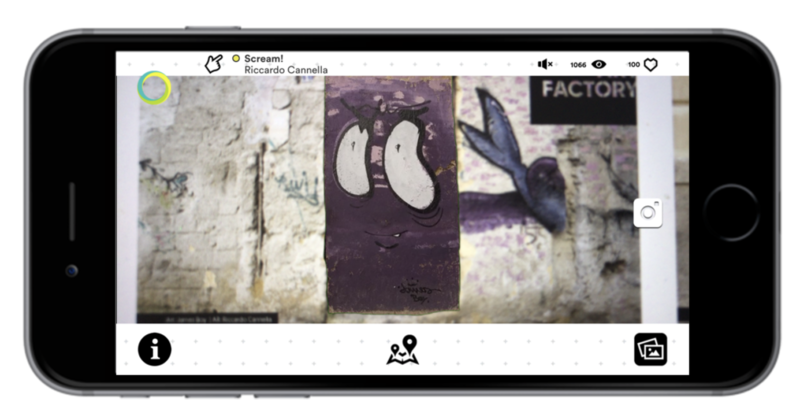 Simply by downloading the Bepart app for iOS and Android framing the works with your smartphone you will see artwork come to life with digital animations developed by 30 young creatives from Palermo. If you’re not in Palermo you can still enjoy the AR animation with the book “Street Art in Sicilia – Guida ai luoghi e alle opere“. Do you want to know more digital tips and a list of mobile app? Read here how to discover Palermo as a techie! If you want to get inspired and have an overview of what you can do in this vibrant city just click play below or go straight to read where to have the best arancini and street food in Palermo. Filed under app, technology, travelnotes. Tagged AR, blog, digital, italy, mobileapp, palermo, sicily, streetart, technology.